The Royal Garden London Hotel is acknowledged as one of London’s most desirable hotels. Situated in fashionable Kensington – offering superb shopping, dining and nightlife - the Royal Garden provides a stylish retreat with wonderful views from the upper floors and restaurant. Also notable for its innovative cuisine and indulgent leisure amenities, the Royal Garden Hotel is popular as a special events venue, with superior levels of service and facilities. The Royal Garden offers guests 'informal exclusivity', with high-class facilities and service in a relaxed environment. The hotel is ideally located on Kensington High Street, with its huge variety of shops, restaurants and nightlife, and is right next door to Kensington Gardens and Kensington Palace. Knightsbridge, Oxford Street and the financial district are all within easy reach. Heathrow Airport is 18 km away (30-40 min by taxi). 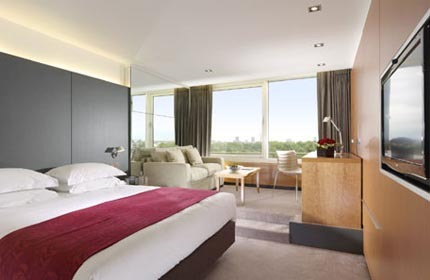 With an emphasis on colour, light and space, 359 rooms and 37 suites feature designer furniture, as well as contemporary and dramatic fabrics in colour schemes to complement the lovely views over Kensington Gardens and Hyde Park afforded from many of the rooms. Truly oversized sitting areas and stunning marble bathrooms, air conditioning and comprehensive facilities complete the picture. The Royal Garden London has superb leisure facilities - the fully equipped Soma Health Club & Spa provides a unique combination of mind body studio classes, personal training and on-site practitioners for complimentary therapy. Situated on the edge of Hyde Park, there is a wealth of leisure pursuits near to the hotel, including tennis and horse riding. The Royal Garden Hotel in London offers the perfect setting for special events and business meetings, with rooms available for an intimate dinner, wedding or grand ball in the flagship Palace Suite. Royal Garden Hotel banqueting staff are on hand to provide impeccable service. Call now for the latest availability and to book! For discounts and room offers exclusive to World Airport Guides, quote the code below! Please note: The term as well as all associated graphics, logos, and/or other trademarks, tradenames or copyrights are the property of the Airport authority and are used herein for factual descriptive purposes only. We are in no way associated with or authorized by the Airport authority and neither that entity nor any of its affiliates have licensed or endorsed us.